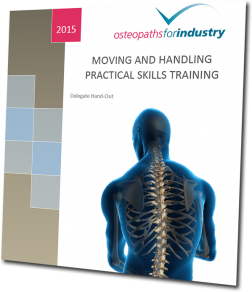 Osteopaths For Industry offer people moving & handling instructor training and train the trainer courses. Bring our expertise into your organisation. 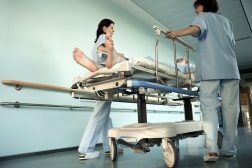 Having your own team of in-house Moving and Handling Instructors is an excellent way of managing the risk of injury posed to staff through Moving and Handling. The flexibility of having an in-house team of Instructors enables organisations to respond quickly and effectively to Moving and Handling issues that become apparent, providing training and risk assessments to minimise any risks. Your Moving and Handling Instructors will have access to our panel of expert trainers, in order to provide them with any help or advice they may require. We ensure that queries are answered within 24 hours. Our Course Notes provide your newly qualified Moving and Handling Instructors with a resource to reference at any time. These can be tailored to suit your brand or specialist activities and apparatus that you use. We provide Instructors with a short PowerPoint Presentation that they can then customise to use in their own training sessions. This can be fully tailored to your company brand, and working practices, prior to the course. Osteopaths For Industry’s training portfolio includes an extensive range of people moving & handling practical skills and risk assessment training courses, suitable to train new instructors for your organisation or refresh existing ones. Here are our most popular ‘in person’ training courses for Manual Handling Instructors/Trainers (we also offer online courses). We are able to tailor the length and content of courses to meet your exact needs. These courses are designed to train new instructors, who will then be able to train your delegates within your business. We can train up to 10 delegates in People Moving & Handling Practical Skills and Moving & Handling Risk Assessment. We can train up to 10 of your delegates in People Moving and Handling Risk Assessment. These courses can be scheduled at any time for 3 or more delegates (subject to our trainer availability). Please contact us for your tailored quotation. These courses are designed to refresh existing instructors. We recommend that refresher training is undertaken every 3 years. Your instructors DO NOT need to have been certified by OFI originally in order to participate in one of our refresher courses. We can refresh up to 12 delegates in People Moving & Handling Practical Skills and Moving & Handling Risk Assessment. We can refresh up to 10 of your delegates in People Moving and Handling Risk Assessment. Your colleagues have quick access to our experts for advice on any Manual Handling issues they may have. We ensure that queries are answered within a maximum of 24 hours. Queries are submitted by email initially and one of our experts will call back to discuss the issue and help to resolve the problem. Our Course Notes provide you with a detailed resource to reference at any time after the course. We are able to fully customise these to bring them in line with your corporate branding, including logos and pictures from your work sites, and to alter the content of the course notes to suit your working practices, processes and equipment in use. We can provide several cards for each delegate free of charge. If a larger amount was required then these can be ordered, along with other support products that we provide. 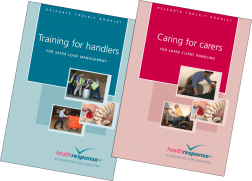 We also provide several relevant documents from the HSE relating to Manual Handling, such as the MAC Tool and information on Manual Handling Aids. Your organisation will have free access to some of our online training tutorials and educational videos, featuring our expert trainers and qualified Osteopaths. The videos cover topics such as Spinal Anatomy, Cumulative Strain and generalist Lifting & Handling best-practice advice and tutorials.